I have FINALLY gotten around to swatching some nail polishes I got in a swap from my friend Helen from Helen and Sheenie’s Nice Things in England. She sent these SOOOO long ago, I feel terrible! Oh and I must say she’s new to Twitter also, so if you have a Twitter account, check her out at @HelenNiceThings. 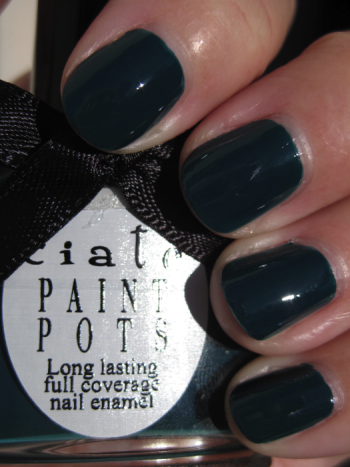 The polishes I have today are from a brand called Ciate from the UK. I have had my eye on these honeys for an eternity, mainly because of the adorable bottles! You cannot tell me that’s not ridiculously cute! The formula on these isn’t the best on earth, but certainly not the worst. It is a little thick and sticky, but I didn’t have to do any special tricks to get it applied nicely. They were all opaque in either one or two coats also, which is nice! 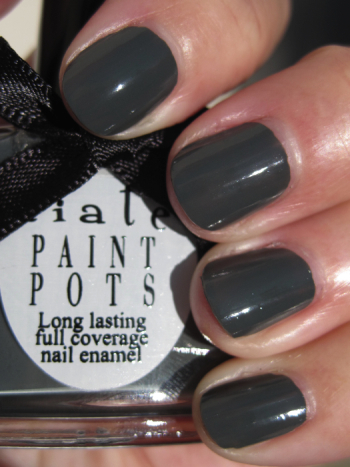 Vintage is a dark asphalt grey creme. This one really amazed me because it was totally opaque in just one coat, which is what I used here. Mojito is a really bright lime green creme. I thought this was going to be too yellow and icky on my skin tone, but turns out it’s really nice, if not REALLY EYE-CATCHING! This was a wee bit streaky though as a lot of lime greens seems to be. This was two coats. Starlet is a purple/blue/green duochrome shimmer. This one is gorgeous and totally worth owning. The duochrome effect is a little subtle, but it’s still there! This was two coats. Superficial is a really dark blue teal creme. This is another one I really like. I don’t have any teals like it. This was two coats. 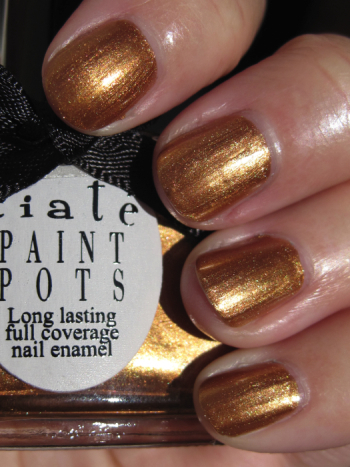 Gold Digga is a warm coppery/gold shimmer. Love it in the bottle, but on my skin…not so much. It’s too warm for me, but I can see other people wearing it and it looking amazing. This was two coats. I am really glad I had the opportunity to check these out since I had been coveting them for so long, so thanks Helen!! Oh and Helen sent me some other goodies from England which I will be sharing with you also when I have some time to swatch them! .-= Phyrra´s last blog ..GeoGrafx Shooting Star =-. Vintage is the one that I am drawn to. I will check her out on Twitter too. .-= Marisol´s last blog ..Wish they could all be 4 day work weeks =-. .-= Inbal´s last blog ..Wow blue No. 51 ×œ×§ ×›×—×•×œ ×©×œ WOW ×ž×¡’ 51 =-. I’ve been plotting a Ciate order, so these swatches came at the perfect time – thank you! While I’m bummed to see that Vintage isn’t as green-hued as some other pics led me to believe, you spared me from future disappointment. .-= keerthamina´s last blog ..notd: sephora by opi what’s a tire jack? matte =-. Oooo, Ciates. I love them all and I have a lot! I have some swatches on my blog too… if you’re interested. .-= Maestra´s last blog ..Essie â€“ Aruba Blue and Shelter Island konadicure =-. Love them! Especially starlet and superficial! And what a cute bottle. Do you know where to buy these? .-= Xibalba´s last blog ..Essence: All Access =-. Vintage is probably one of the best greys that I have seen this season! What an awesome brand. As always, thanks for sharing! How do us American chickas obtain such adorable and fabulous polish????? Is there a website???? Musst know. I had to do a swap with a British blogger to get them because I couldn’t find them online here! I LOVE Vintage & Starlet!!! Reminds me of Nfu-Oh’s 133 I love that color & GS14. Anywho, I found where you can get them. So I’m ordering mine today! HQ Hair also ships Ciate to the US (though they have less selection than these other two options). Hope this helps. .-= Liz´s last blog ..Hard Candy Dork =-. They look amazing on you. If I’d have known Superficial and Starlet were that good, they might have “accidentally” been forgotten about when I wrapped up your parcel! Haha only kidding. They look fabulous and I’m glad you like them. 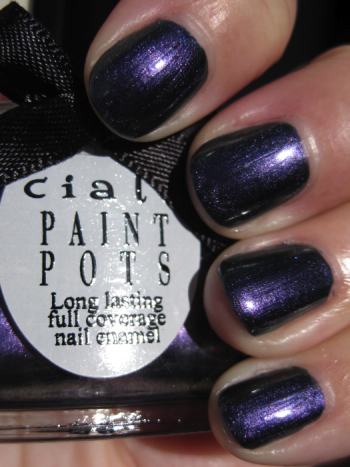 .-= Helen´s last blog ..OPI Kreme de la Kremlin =-. .-= Caitlin´s last blog ..Leopard Nails with Gold Glitter! =-. Aren’t they the most adorable polish bottles?! Superficial is my favorite. They all look lovely on you. I’m also liking Gold Digga. That is gorgeous. Wow… I really liked/loved all of those. Like you I usually like a couple but these are all great and some unique colors. And you’re right.. they had me at bottle design! Hi Kelly: That last comment I never did finish what I wanted to say correctly, sometime the PC has a mind of it’s her own. Is there a way to delete the first comments? So here it is: 1) First off the bottles are very cute, the bow does it all for the added effect, LOL. 2) I love Vintage, that Grey creme it just gets to me and love the totally opaque solid look. 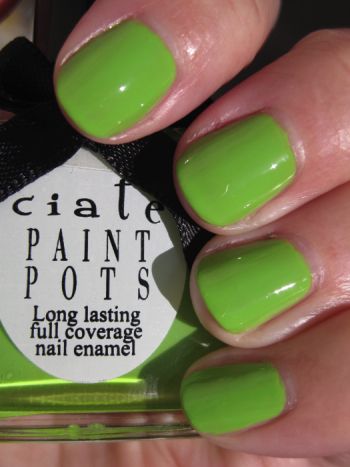 3)Mojito-what a fun lime green shade! Looks great with your amazing skin tone Kelly, gorgeous color for you to wear and be amazing. I can see this on hikes, bike rides, anything athletic, carnivals trips, canoeing it’s just for you and it spells out fun with a capital F.
4)Start-let is a romantic gorgeous purple/blue/green/dark green du-chrome shade for those amazing long romantic dinners or nights on the town with your loving husband or with close friends. 5)Gold Digga-reminds me of the Ian Fleming, 007 series, “Gold finger” with James Bond. It’s for some people who can pull it off and some who can’t. It’s also for personal taste, if you love it , great if not, well, as you said it looks great in the bottle and may look great with another shade. Myself, I will pass. Although, it still looks awesome on your nails Kelly. 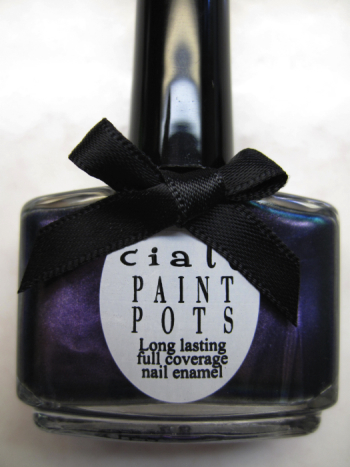 It’s been a blast with Ciate Nail Polish Swatches and can’t wait for what’s next. Have a great evening. Peace.